I wonder how many of us will have our bodies remain miraculously intact through the ages. At least intact enough to be dissected, mounted and placed in some museum like the mummies of Egypt, Otzi the Iceman or even Lucy, the Australopithecus. On the one hand it’s kind of cool that these ancients were able to live on in some way, but on the other, it’s somewhat grotesque. I think about this often and have come to the conclusion that I’d rather be unearthed by a (hopefully) benevolent alien race then sentient robots. Neither can be trusted, really, but my hope is that aliens would learn more from my DNA, stomach contents and bone structure than robots would. Of course, in the end, there’s always cremation as an option, but that may be robbing my corpse of an adventure, and I wouldn’t want to do that. Oh, and if you’ve just joined us and have no idea what’s going on, I’d suggest going back a few strips to the beginning of this storyline, here, and all will become clear. Well, I got second *FIRST! * in a row! And Cornfather has beaten me to rescue excavation… Though I realy cant understand why does he think he was offended. I dig crystal skull, but lets just say that your scenarious are riddiculous. Everyone knows it would be robots to find the skull and aliens playing CSI on you. By the way, are those aliens the same extraterestrials that are responsible for musashis absence? well, i’m sure jefbot would’ve rather had you rescue him than the Cornfather, Maryz. especially since Corn’s “rescue” comes with strings. and there’s still time for the Cornfather to put that box back since we don’t know if jefbot will concede to those demands! as for the nature of the aliens: well, these scenarios are only in bot’s mind, but since they’re manufactured by his subconscious, it’s possible that the look of the ETs aren’t entirely fabricated. only Musashi knows for sure at this point. tell me about it, Alex. it’s still in its shrink-wrap on a shelf, waiting for me to finish Mass Effect 2 and Dragon Age. It would be quite funny to mix this a little with the previous chapter to make Jeffbot squeeze through the boxes with his power of SCRAWN after Corn puts the box back, and sneak upon him with a surprise attack. oh..i would say sorry…sorry that i have to kill you for selling my stuff!! Poor Jefbot. XD He’s going to need a medic for this. Glad he didn’t end up like Michael did when he was acting in real life! i’m glad too, Ahero! if he was injured too badly, the strip’s title might have to be changed from “JEFbot” to “The Cornfather” for a bit. I loved the crystal Pokeball. To me, that just sums up what Jefbot is all about. glad you caught that detail of the crystal poké ball and i gotta say, i agree with your assessment of it, Kerubim! That may be my favorite sentence that anyone has ever produced. Im with you on that TCG. NO APOLOGY! Cornfather couldn’t possibly just leave him there…could he? He is a friend…right….right?!?! Corn thinks he deserves an apology ‘cuz he’s a bad, bad, friend, TCG. i kid! he just wants to punish jefbot a bit for chasing him out of the apartment, even though the Cornfather, himself was in the wrong. 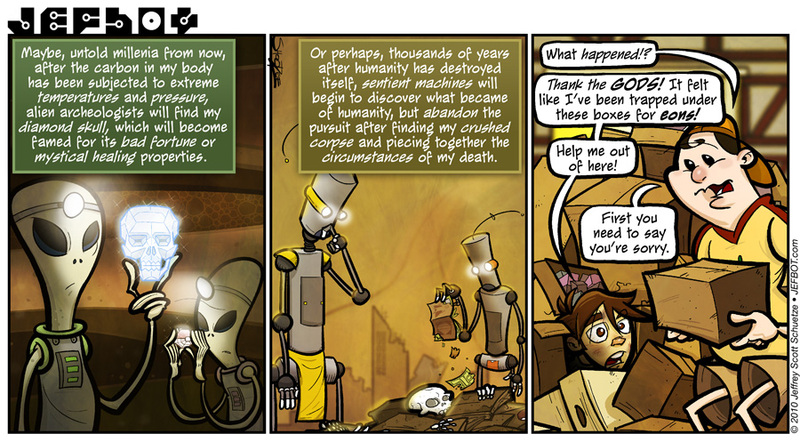 we’ll see if jefbot complies with those demands in the next strip. I hope that show comes back! It had some interesting storylines. Dem Eet! I hate it when someone sees you in a bad situation and still insists on an apology! Poor Jefbot, CF is going to make him squirm. No fair. Shenannigans! you got that right, Pixie: the Cornfather’s gonna take advantage of this situation and make jefbot squirm. i second your call of shenanigans! ha! if cel walked into that situation right now, she might just walk back out and never be seen from again, ESQ! I thought the power of Scrawn was going to come in handy in that situation and jefbot was going to lithely find a way out. Instead it was the power of Chub needed to lift the heavy things. yeah, the Power of Chub > Power of Scrawn in this situation, 11TN. once you got a scrawn-powered dude pinned, it’s all over. Cremation is the way to go! I’m NOT gonna leave nothing for the maggots! They can get themselves jobs to feed themselves for all I care! I’ll be cremated along with my computers, toys… and my cats if I have anything to say about it. Hmmm… maybe I should make myself a pyramid and stuff it just like the ancient egyptians did. Must be interesting to have a Vitorian Goth Pyramid. My whole collection of black victorian skirts most be awesome. Still, my body will be cremated. Shoooooo to the maggots! Shooooooo!! Michael is very smart. What’s the magic word, jef? and if you ever build that goth pyramid, i’ll pay to see it. I can only aume you mean the word *please*, Sonitan. But in our language we have a word/sentence/querry alternative that fits this situation perfectly. Its *Prijebem ti? * and its one werb that can be loosely translated as *Am I supposed to oblige your request to be f***ing punched in the gut? * Its not realy as offensive as it may sound and is mostly used in familiar company, so I think it fits this situation perfectly. Oh dear Maryz… the magic word for me is… DIE!!!!!! “Prijebem ti?”???? (Am I supposed to oblige your request to be f***ing punched in the gut?) Where are you from?!!! What other awesome words you have in your vocabulary?? Glad you like it Sonitan, tough I do think that continuing in this discusion should be done in different kind of forum. Oh, and Im from Slovak Republic. If you throw a dart into the middle of map of Europe, thats where we are. I agree! I don’t think you should have to apologize… I would also like to second what EvilStepQueen said, I can’t wait to see Jefbot and Cel back in action!!! Awesome job Jefbot, I love the last frame, the look on your face is outstanding! thanks, Funnyshaffer! glad you’re a cel fan – she’ll be back soon! Great strip. BTW, I wonder what a diamond skull would go for on e-bay (or the alien equivalent of e-bay). i think you’re right, shanna: robots will take over before the aliens arrive. that’s why i profess my love for technology so much – so when the machines gain sentience, they’ll spare me and keep me around. like Baltar in BSG, basically. the original, not the re-imagining. mark my words: the hand will be back! Wow, this is a really awesome one. I didn’t know where you were going with the first two panels and then it became awesome. I think I’d do the same if I were stuck under a pile of boxes. thanks, D! sometimes i don’t know where i’m going in the first two panels of any given strip, either. glad you think about your future-corpse too, Spanks! also glad you think jefbot has no reason to apologize. now we’ll just have to wait and see if bot holds true to that and remains in his box-prison or gives in to the Cornfather for freedom. I’d like to know how their gift was knowledge?! Their gift was making your head blow up! seriously! they can keep their sucky gift! heheh. OK, enough is enough. It is time for Jefbot to let his darkside flow. He needs to dig deep down and find his Power of Scrawn and just unleash it all over CF. CF has helped enough by moving 1 box, this rest should be easy. APOLOGIZE FOR NOTHING!!!! Remember, the last time we saw CF, JB was fuming at him. The image of CFs face should reignite that anger! the dark side does make one stronger, Slave1, that much is known. as for whether it will enhance the Power of Scrawn? remains to be seen. You say you haven’t seen the show “Hoarders”, but this strip exactly illustrates the real dangers of hoarding. When I die I’m going to have myself turned into a diamond ring for my daughter, I have other “happiest place on earth” plans but I think my family (even though they promised) will be too chicken to carry them out! So, I’m going to have myself crushed into a diamond and then my daughter will always have me with her, until she loses the ring…. what color ring, mal? just wondering. and to make sure your daughter doesn’t lose it, you should have the diamond grafted to a bone. like on her forehead. I LOLed at the mental image this one evoked. Mom diamond grafted to forehead – too funny! might be a bit painful, tho. heh. Ha, this comic tickles me. But, I also love to speculate about my eventual demise out loud in front of my wife. It drives her crazy. glad you were tickled, SY! and yeah, some people just don’t like to talk about what’s going to happen to the earthly husk they’ll leave behind. weird. you definitely get points for the callback to JEFBOT.30_Kimota, GMT! “lol” is one of my favorite phrases to hear (or read, as the case may be), IDTMRB. You cant blame them for want to have at least something hanging there. so apologize first, take it back once i’m free, then release the wrath, right, JF#300? you readers are a sneaky bunch. heheh. Haha! I love the Indiana Jones and I Robot references! i don’t think even i’m catching all the references in these strips anymore, Eptha! Sooooo many references. Its like a Geeksplosion! Indiana Jones Aliens definatly cooler than the Aliens from the end of AI though. glad you dug the geeksplosion, Liam! heheh.